Norwegian Cruise Line, the innovator in cruising, has announced the completion of the refurbishment of Norwegian Jewel as part of The Norwegian Edge® program, reaffirming the company’s commitment to elevating the standard of excellence across the fleet. 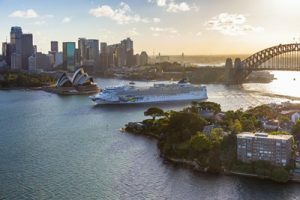 Following a two-week dry dock in Singapore for the company’s most extensive enhancement project in 2018, Norwegian Jewel will debut in Sydney, Australia on Saturday, 1 Dec showcasing refreshed venues, updated spaces, premiere entertainment and redesigned staterooms. All 1,188 staterooms were upgraded with new televisions and USB outlets, as well as new carpet, artwork and furniture. The Haven by Norwegian® received updates to the courtyard, additional cabanas on the sun deck and new finishes, carpets, tiles, drapes, artwork and furniture for all suites and villas. The ship also boasts two new Haven Deluxe Owner’s Suites, at nearly 111.4 square metres and featuring large, 52.6-square-metre balconies, two private jacuzzies and accommodates up to four guests.